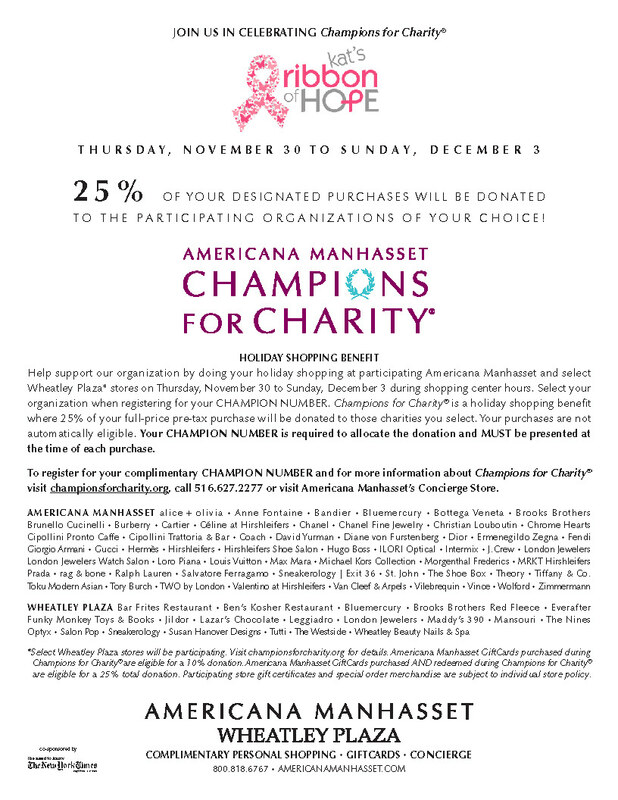 Once again, we are proud to participate in Champions for Charity at select stores at Americana, Manhasset and Wheatley Plaza, Glen Cove. Please support Kat’s Ribbon of Hope by doing some Holiday shopping during 11/30 – 12/3. Our opening cocktail will take place on Thursday evening 11/30 at Loro Piana. Don’t forget to register in advance so that you receive your Champion Card. To register for your complimentary card, please call 800.818.6767 or visit championsforcharity.org. Registrants will receive their Champion Card Number on or before November 30. It is also possible to register and immediately receive a Champion Card Number anytime during the event at Americana Manhasset’s Concierge storefront location. Charities may not register individuals on their behalf for a Champion Card Number. Individuals must register themselves. Thank you for your continued support in the fight against breast cancer!